Amanda Sun’s debut novel, Ink, was one of my favorite reads of 2013. I hoped that Rain would be at least as good as its predecessor. It wasn’t. I plowed through this book in two days flat. I just couldn’t set Raindown for long. Honestly, the novel was so tightly plotted that I had a hard time finding where I could stick my bookmark without feeling that I was abandoning the characters to their fate. Rain transported me. 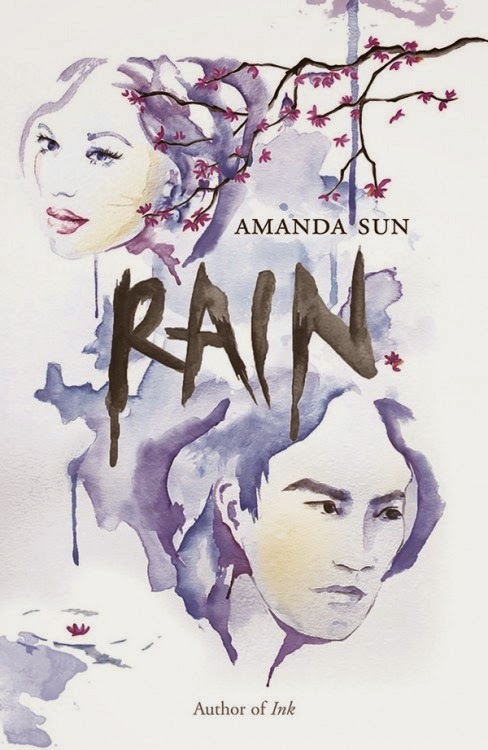 Amanda Sun has a real gift for description. She masterfully slips in all kinds of sensory details that immerse the reader in her world. When it comes to creating setting, she has a light, artistic touch. It’s the little things that make the story come alive, woven smoothly into the narrative: the hum of vending machines, the smell of food at a festival, the bubbles fizzing in a glass of melon soda. These descriptions were my favorite aspect of Rain—and they’re the reason why I’m currently rereading the book. I can’t get enough of Sun’s descriptive writing. Speaking of Sun’s writing: I’m a hard sell when it comes to first-person narration. The YA market is flooded with novels that have no business in first-person, but are nonetheless. To write successfully in the first person, the viewpoint character needs 1) a unique, believable voice and 2) a damned good reason to be present for every important event—because, of course, in a first-person novel, if she’s not there, the audience doesn’t get to see it. Often, this results in a lot of protagonists “conveniently” overhearing important conversations or otherwise being shoehorned into unlikely situations because the plot demands it, dragged around by a very obvious authorial hand. Rainis one of the few, bright exceptions. Both Katie’s narration and her presence in the story are wonderfully organic. Katie struggles in this book—and not just with the ancient supernatural forces gathering around her. Her Japanese isn’t up to scratch, and she’s in danger of having to transfer to an international (English-speaking) school, away from her only real friends and the boy she loves. She’s still grappling with Japanese social conventions. And then there’s all that trouble with the yakuza, and the fact that her boyfriend is a kami with dangerous powers he can’t control. Put it all together and you’ve got the makings of a fantastic book. Danger! Mythology! Culture! Romance! Kendo! A positive relationship between Katie and her aunt! Well-developed secondary characters! (SATOSHI, MY LOVE.) Rainhas it all. Honestly, my biggest complaint has nothing to do with the story. Many Japanese words and phrases appear throughout Rain, but you have to flip to the glossary in the very back of the book to find out what they mean. While the language adds texture and realism to the story, I was annoyed at having to interrupt my reading experience every few pages to visit the glossary. What’s more, there’s no indication (say, in the front-matter) that the book includes a glossary at all—so if you don’t know it’s there when you start reading, you’re going to be flummoxed and frustrated by Japanese phrases, only to kick yourself when you reach the end and discover that the translations have been right there all along. Is it so hard to design the book with footnotes instead of a glossary in the back? Throw me a bone, here, Harlequin Teen! The flustered crowd swelled around us, elbows and shoulders prodding into me, squishing me until I felt a claustrophobic panic attack coming on. It reminded me of Mom’s funeral, the heat and sweat of all the bodies circling around me, too close. “Here,” Tomo said, pressing his hands against the wall on either side of me. The crowd continued to push toward us, but Tomohiro took the brunt of it, forced closer and closer toward me. “Thanks,” I said. He nodded once, bracing himself against the umbrellas and bags that jabbed into his arms and legs. We were pressed together like sardines; his breath was warm against my neck, and I could see the ribbons of badly healed scars trailing up his right arm. The biggest, where the painting of the kanji for sword had sliced him in elementary school, was mostly hidden under his soft wristband, but the edges of the scar trailed toward his palm and up his arm. He hunched over me, trying not to press his body against mine, trying to give me some kind of modest space. This was the kind of guy he was, I reminded myself. Not the one who could lurk in dark alleys and call up people-eating dragons just by sketching them on paper. But that was him, too.